The Kayabukiya Tavern (居酒屋 かやぶき izakaya kayabuki?) is a traditional-style Japanese “sake-house” restaurant (izakaya) located in the city of Utsunomiya, north of Tokyo, Japan. The location attracted international attention in 2008 when the Western media reported the tavern and its news movies were uploaded to YouTube. The tavern’s owner, Kaoru Otsuka, owns two pet macaque monkeys who are currently employed to work at the location. 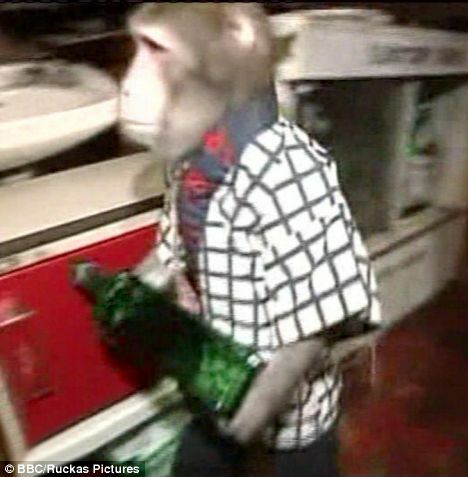 The first monkey, twelve-year-old “Yat-chan”, is dressed in a shirt and shorts while he takes customers’ drink orders and delivers them to the diners’ tables. The restaurant’s owner, Otsuka, reported that he never initially taught the monkeys; Yat-chan first learned from watching him work. Otsuka said, “It all started one day when I gave him a hot towel out of curiosity and he brought the towel to the customer.” The younger macaque, named Fuku-chan, is currently four years old and has the main duty of bringing the attendees hot towels to clean their hands before ordering drinks. Fuku-chan has only two years of experience, while Yat-chan has been reportedly performing the job for a longer time. Both monkeys receive boiled soya beans from customers as tips for their service. The monkeys’ environment has been inspected to ensure proper treatment of the animals; due to Japanese animal rights regulations, they are each only allowed to work for two hours a day. The owner says that he will be introducing more simians to work as waiters at Kayabukiya, and as of October 2008 is currently training three young monkeys to take on the job. The restaurant was also featured as a reward for the winning team in the third episode of Season Two of I Survived a Japanese Game Show.